After attending any Value Investing or Stocks Trading program, you walk away with the new found knowledge that you could be the next Warren Buffett. You apply what you have learnt. But the result is not what you expect. Something like this kind of feeling – Money down the toilet, after paying thousands for an expensive learning program but still cannot feel the ROI. Investment still not profiting as you thought, or worse, in the red! So you thought, you must be missing something else, or , a more advanced knowledge. You then attend another seminar… you find your knowledge is still not enough because results still not desirable. You may also find that your own result or new information learned differs from what was being taught previously. So you will attend yet another course..hoping to find that holy grail..
One after another seminar, your thirst for more knowledge becomes increasingly unquenchable. You are not already fully invested. But if you are already fully invested and short of cash, there wasn’t much you can do during market plunge. The thing is – it was not hard to see the “value” in value investing when market is at deep discount. At other times though, knowing about Value Investing isn’t very useful if the market is NOT at deep discount. But more importantly, there are 8 primary reasons why you are not achieving success in Value Investing yet. In 2008-2009 global financial crisis, almost everything became a lot cheaper, it doesn’t matter if you are buying a stock, a corporate bond, a house or a car. There were deals everywhere. Why would such deals exist? Wasn’t the value too obvious? You don’t need to pay for any value investing course to see the ‘value’ when the whole stock market is in deep discount. Wells Fargo (NYSE:WFC) was traded at $8 at that time, but Buffett was all-in on Wells Fargo at a price of low $20s in November 2008 using his personal investment account. 4 months later, this stock was 3 times cheaper, did Buffett add a lot to his position? As a matter of fact, he didn’t. Of course, he couldn’t add to his personal account if he was all-in, but even for Berkshire Hathaway, he didn’t add a lot of WFC either, because as he said, he wouldn’t go below $20 billion cash since the company can’t have a slight chance to live on other people’s mercy. In other words, even a well-heeled investor like Warren Buffett wouldn’t be able to take advantage of that bargain price even if he wanted to. Again, it was not hard to see the “value” at that time, but when you were short of cash, and everything else became much cheaper, there wasn’t much you can do either. The fact is, value investing does not teach you how to pivot (read: what to do in averse situation) when you can pick up 30% more stocks with the same amount of cash later on, at the same time when your invested portfolio is down by 30%! “Wait for it to come back up!” or “The market is irrational!”. The fact is, it is easier said than done. It would be easy to brush off the statements I made above, if not for the fact that the market can go further down, or sideways… for a horrifyingly long time. You sit and wait. For months? For years? Investments still in red after all the hard work and time spent? Value investing teaches us that it is a “Hell Yeah!” criteria when the CEO and/or Chairman have major stakes in the business. This way they have more incentive to make decisions that are aligned with the interest of the rest shareholders. That kind of conventional wisdom is reasonable, but not without caveats. The value of a business could be dramatically different when you have “control” on the business. Take many of the Asian family businesses held privately as an example. They tend to hoard cash without distributing it to investors. On one hand, it is a conservative approach that will make sure the business can survive for the next few decades. On the other hand, it is a very inefficient deployment of capital, and a way to destroy value over the long run when it is not used for revenue generating activities. It is not unreasonable for the owner though since personally they need some safe investment like bank deposits anyways, and they can issue a special dividend whenever they need the money, or just make some investments whenever they see fit. But don’t lie to yourself, you are NOT even half the business owner in the stocks you invest than you think you are. If you hold even a hundred shares of CK Hutchison Holdings, you can’t just walk into any of its many business establishments and instruct things to be done what you deem fit. But Li Ka Shing can. He is bailing out multiple conglomerates by getting preference shares and warrants, which is one of the possible reason why he was not buying WFC ordinary shares from the broad market even if it was at a deep discount. Holding preference shares is a far better deal than common shares because dividends are paid out to shareholders before common shares dividends are issued. If the company enters bankruptcy, the shareholders with preferred stock are entitled to be paid from company assets first. Preference shares is out of reach for most retail investors, like you and I. Even if the market is not at deep discount, you are sorely mistaken to believe Warren Buffett got rich by investing in great companies at fair prices i.e. Coca-Cola, American Express and Wells Fargo. Buffett spent years (1988 – 1989) accumulating Coke stock for approximately a billion dollars. Even if you can find such an enticing company today, where do you find the billion dollars to invest? Wake up, slap yourself and know that you are just minority shareholder by purchasing a few hundreds, or even a few thousand lots of a company stocks. You won’t have this control and freedom as compared to the CEO or the business owner themselves. In the 50’s, Warren Buffett started off as an activist investor, far from being a value-investor who only look at fundamental analysis passively. Why? Because he would acquire small undervalued companies with which he could take economic control of. Buffett called them “work-outs” where corporate action was required for the company to unlock value. The company you believe to be undervalued would require the management and/or the market to act on its cheapness to fully value the company, whilst Buffett would simply buy a majority stake and push the management to make the changes. A retail investor can only hope for an activist intervention that’s in his favour, but that’s a lousy investment thesis to begin with. Furthermore, in desperate times, you may have to sell their stocks at unfavorable prices in order to raise cash for other investment purposes or personal needs. It is different if you ARE the owner of a business by holding majority shares and have decision making ability. When there is an opportunity to sell the business to a potential buyer, the value of the business may be considered artificially high by an owner because it has more than the economical interest to that controlling owner. In this sense, the “value” to the owner/operator also contains his/her personal pride, personal value and achievement. The “value” of this business can be well beyond the future cash flows this owner will receive. But do you share the same sentiment? For this reason, the owner, like Li Ka Shing, may not be selling his core business even if it receives a high bid price from a buyer. So what if his net worth got reduced by a few billions when market drop? No big deal. He’s not bothered by it. But for you, you’ll by panicking when your $ 100k holdings were to drop 50% in value overnight. When this happens, it is hard to be practising value investor. The discounted cash flow (DCF) model is the touted valuation method to determine if a stocks is undervalued or overvalued at its current price. However, in practice, it is often very diffcult to use it. Besides the challenges of estimating all the future cash flows, it is also hard to say what discount rate or cost of capital is considered as “fair” when we try to estimate the intrinsic value. *Intrinsic value is calculated by taking a discount to future cash flows. Value investors use a discount rate relative to the current risk-free rate when using DCF model. Risk-free rate can be Cash Deposit rate (circa 3% in Malaysia or near 0% in Singapore) or government bond yield. It seems to be reasonable since investors of equity asset should require a premium over risk-free asset. So if 10 years government bond yields 3%, and you require 5% more yield as the premium to hold a more risky asset like stocks, you might use 8% as your discount rate. But in reality, this does NOT work unless you are investing in a vacuum. Risk-free rate changes over time in a dramatic way. Cash deposit rate in Malaysia used to be circa 10% in the early 80’s , but today it is only less than 4%. Therefore, whatever discount rate you use for stocks, the fair value computed from that discount rate will also change over time, if that discount rate is based on the risk-free rate. Besides, it is near impossible to speculate what the interest rate (which correlate to risk-free rate) will be in the future. Anyway, picture this – is it sensible to justify a company stocks with 6% annual cash flow yield when the investor can easily get 5% interest from cash deposit or bond funds? If you are a novice value investors, you will go for 5% cash deposit. In an inflationary environment, a business’s income will naturally go up based on inflation rate, but the bond or CD’s interest rate will not move at all. This long term ‘inflation hedge’ is very valuable, but not obvious until something really bad happens (like a hyperinflation), which stretch the gap between stocks yield & risk-free-rate. Consider the situation of emerging market countries – Brazil and Russia, where the inflation rate and bank deposit can yield 10%, stocks with 10 times P/E (Price to Earnings ratio) certainly don’t look cheap in this context. However, if some kind of hyperinflation indeed happens later for one of them, the value of any cash deposit (denominated in that currency) will be reduced dramatically when it stays at 10% per annum. On the contrary, the real business value of a business will suffer a much lesser impact. By definition, inflation means the prices of goods go up in general, this change may not be evenly distributed, as some businesses/industries like consumer staples have more pricing power than others, say, luxury goods. But in general and in average, a business’s value is hedged by the corresponding changes of prices, while the bond is not. But what if a company is in a business where it has no pricing power, and its cash flow does not naturally grows at inflation rate? Using DCF method to value a stock’s intrinsic value is useless in this sense. In reality, investors almost always have a portfolio instead of a single stock, so the value of any additional investment is relative to the other existing positions in that portfolio in terms of risk-adjusted returns. For example, if the financial sector (typically acts as the bellwether of business cycle) is under stress, you might find a lot of cheap financial stocks. However, the value of another cheap financial stock is much less to a portfolio that is already more than 50% weighted in the financial sector than to another portfolio that has no financial stocks at all. You fail to consider that the plunge of stocks in financial sector is limited to itself while other sectors like consumer staples maybe still doing fine. The business cycle is not heading into recession, so it may be a value trap in the financial sector. In other words, while each individual stock has its own value and risk, the real risk and value investors should care about is on the entire portfolio. Just because your best idea is 3 times more attractive than your 3rd best idea, it doesn’t mean you should keep adding the former, and completely ignore the latter. This is from Andreessen Horowitz, simplified. Times are changing — the destructive power of technology is starting to break down companies faster than ever. The classic case is Research in Motion (RIM). In January 2007, RIM was trading at a high 55x PE multiple. Over in Cupertino, a computer company called Apple had reinvented itself as an MP3 player company and was now unveiling a new phone set to launch in the summer. 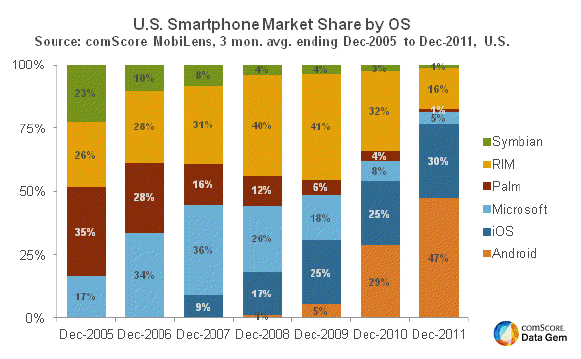 By the end of December 2009, market share for Apple’s iPhone iOS as a percentage of US smartphone OS was 25% while RIM had increased from 28% to 41% in that same period. Though RIM had grown market share, fears of iOS growth had toppled the PE multiple to ~17x. Many traditional, value investors sat back and thought, “Well, RIM is holding up pretty well compared to the iPhone, yet their PE multiple is getting destroyed.” It’s trading at near the historical average S&P 500 PE multiple of 15x. Apple hasn’t historically been strong in the enterprise, so maybe iPhone will just be a consumer phenomenon that doesn’t break through to business users. Android is irrelevant with 5% market share. The smartphone market is growing rapidly and RIM is the clear leader. RIM is still growing north of 35% and generating nearly $2.5B in net income. I think RIM looks cheap! Two years later, RIM was trading at a 3.5x PE multiple and topline growth had screeched to a halt. Market share for RIM had contracted to 16% while iOS and Android combined for 77% market share. In fact, in 2012, RIM posted a net income loss of $847mm. Investors lost a ton of cash and were left scratching their heads. How did this happen so quickly? Why did net income fall off a cliff? Why now? In 1962, Everett Rogers presented his thesis on the diffusion of innovation. 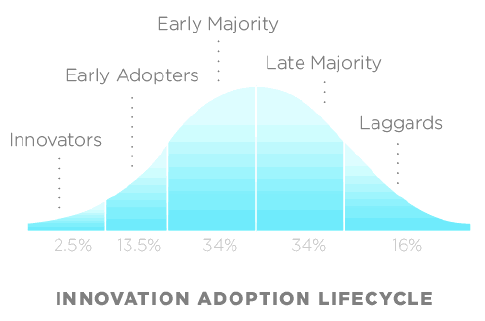 The idea is that the adoption of new technologies follows a bell curve comprised of innovators (2.5%), early adopters (13.5%), early majority (34%), late majority (34%) and laggards (16%). The cumulative adoption of technology over time generates what is known as the S-curve. Over the last 100 years, technology adoptions have always followed this same S-curve leading to market saturation. What has significantly changed is the rate of adoption. New technologies are being adopted much faster than ever before. While technologies from the early part of the century like electricity, automobiles and the telephone took well over 50 years to reach 50% adoption, newer technologies like Internet, PCs, smartphones and tablets are being adopted much faster. There are several factors that go in to how fast the technology gets adopted, including how discontinuous the innovation is and the per capita income, but the reality is adoption pace is accelerating. The flip side of this is when new technologies get adopted faster, incumbent solutions die faster. Quicker adoption leads to quicker destruction of old technologies. For example, no longer do people have the need to print out paper and file documents away in those ugly green folders; they store all their documents in a cloud service like DropBox. I don’t even use a notepad anymore; I write notes on my iPad and save in my Evernote account. Printers, fax machines, paper, pens and notebooks are all items that were central to the office 15 years ago but aren’t relevant in the digital office. Software doesn’t just challenge businesses through direct competition; they can upend businesses through a systematic digitization of the world, rendering goods and service that a company is offering obsolete. With technology upending markets, remaining a traditional value investor is a death sentence. In the case of RIM, the company thought that their scale was defensible and stopped innovating on the operating system, favoring battery life instead. Apple’s iPhone operating system and associated software was an order of magnitude better than RIM and attracted consumers. While there may still be opportunities for value investing, you need to be cautious of businesses that appear to be on a slow decline. With the rate of technology adoption accelerating, Internet being a way of life and software consuming the world, businesses who refuse to embrace or adapt don’t just slowly decline; they fall off a cliff and take their cash flows with them. Here’s a personal example of making this mistake. I invested in RIMM using Value Investing principles in 2010 yet I still lose money. But I manage to recover my losses using sophisticated investing method. It is a classic example where a value investor can get burnt by value traps and therefore claim that value investing doesn’t work at all. Buffett’s successes in the past can’t realistically be repeated today as the dynamic has shifted permanently. …that doesn’t mean value investors should always hold onto a stock for 10 years. It is just that the reason for buying it should be for its long-term value. In fact, many value investors always hope to close the value gap as soon as possible. That is why many value investors emphasize on “catalysts”. Another way to think this is that considering investing as a business, the return on investment capital is closely related to “asset turnover”. If the stock can close a 50% value gap within a year, it can be better than another stock that closes a 100% value gap in 5 years. In other words, a stocks with catalysts might be worth a lot more than another stock without any catalysts even when they all have the same valuation on the DCF basis. And secondly, ponder over this deeply – why do stocks have catalysts for growth, on a macro level? An oft-disregarded fact that aided Warren Buffett’s ascendency is the unparalleled growth of the US economy from the 50s to the 90s. In a slow-growing, mature or stagnant economy, it’s much tougher to achieve outsized returns at an annual rate of 20% compounded for decades. Size counts as well – the U.S. economy grew to be the largest economy in the world, the runway for growth is huge for American companies operating within the States itself without having to venture overseas. One can’t realistically expect a company based in smaller country like Malaysia or Singapore that only sells its services/products locally to make one a billionaire. Most countries’ economy, even the emerging ones as we speak, have matured and the runway for growth highly limited. Seasoned investors know that logic does not necessarily prevail in stocks investment. Fundamentally weak stocks can see steep rises in prices while those with good prospects can experience price slides. The invisible hands, aka Market syndicates. They push stocks prices up and down in a relatively short period of time, undeterred by the fact that such abnormal market activity are queried by Bursa Malaysia. Commonly happen to, but not limited to, penny stocks and their warrants. For retail investors (who make up only 20% of Bursa’s stocks trading participation), a pump-and-dump strategy can make you feel like a fool for learning value investing. A example: Comintel Corp (ComCorp) on 21 June 2016. 28.88% drop in the last 20 minutes of trading. Do you know that a 28.88% drop needs a 41% gain just to break-even? The syndicates pushed the stocks up for ‘false breakout’ to the upside with a break above the recent high of 97.5 cents to 99 cents before slamming it down to 66.5 cents. The fundamentals are sound, its P/E ratio was 8.31 times while its net profit for Q4/2016 jumped to RM 6.11 mil Y-O-Y from RM 708k previously. Fundamental analysis in value investing would have been useless in this classic scenario. Retail investors are at the mercy of market syndicates. The fact is, manipulation will still exist in the market no matter how tight is the regulation. Nothing much you as retail investors can do, caveat emptor. Possessing holding power and using average-down method is not ideal solution – they are false sense of security. Knowledge of technical analysis, however, will help a bit. It is to note that while we should not label these institutional investors as market syndicate, EPF, PNB, Tabung Haji or Khazanah Nasional stocks movement will cause the same impact. Markets today are way more efficient than the markets before mid 90’s. There was no Bloomberg, spreadsheet software, trading platform nor the Internet. Most analysis were literally done on paper with a calculator and pen. Buy/sell was done by calling your broker-remisier. Public information was available, but it was scarce as there was no Google to index information and keep it available at a few keystroke. On the flip-side, global markets have never been more accessible today, you can invest into any companies or sectors globally without even stepping out of your room. This makes life easier (or tougher) for the budding value investor. On top of that, there are tens of thousands of funds using highly complex (or simple) strategies to hunt inefficiencies in the markets. We can easily find any company’s annual reports thanks to Google and can analyse its financial data using Excel, we can also use various free stock screeners to screen for “value” plays. And have you heard of HFT – high frequency trading? If you think you are are ‘fast’, there are people and machines which are even faster to capitalize on inefficient market opportunities. Even Warren Buffett himself no longer invests in public equities as aggressively as before as Berkshire Hathaway has grown too large to have a small company move its needle. He now hunts the big game – buying out companies private-equity style to expand the Berkshire holdings. If you don’t believe me, look at the table below, highlighting Warren Buffett’s annual returns versus S&P500 for the past 40+ years. In the 21st century (that’s after year 2000), his annual returns deviation from S&P500 returns had narrowed compared to in the 70’s, 80’s and 90’s. The novice value investors might think the value investing is simple, and it is just buying a stock when its price is much lower than its value. The problem here is that the “value” is never a fixed number, even if you can precisely pinpoint the cash flow in the next 100 years. In some sense, the “fair value” figure in the mind of a value investor is more illusionary than real. That doesn’t mean value investing is not good or not a reasonable investing philosophy though. It only means that as value investors, we have a lot more factors to consider, especially the business cycle and macroeconomics. Sticking only to value investing principles while ignoring everything else is folly simplification. When I just learned value investing (“The Intelligent Investor” happened to be my first book on this topic), it didn’t take very long before I realized that this should work for almost everyone. The philosophy is sound and simple: investing is all about buying an asset when it is cheap relative to its value. It sounds very simple, right? However, after many years of practice and experience, what had been a “simple principle” became blurry to me. The hard work and time spent just wasn’t worth it. And finally after years of research, I discovered a simpler substitute to value investing. It’s a bold statement but if you can suspend your disbelief for the next 10 min, I’ll reveal the figures & analysis. Step 1: Assume you start with 100,000 in 1996. Step 4: You get 164,082. Repeat the same step for 1998 until 2016. You will get the absolute value at the bottom of the column. Now, since you can’t invest directly into “Index X”, there are a few ways you can track the performance of “Index X” so you can very well mirror similar annual returns – the X% return in the table above. 1 Response to "8 Reasons why your Value Investing isn’t Working and how to fix this"
Your quiz does not load at all even after 1 min of waiting. I tried on Chrome and IE. Nada.